In September, I complained that the four post cards I had sent in July from Costa Rica had never made their away ashore. Well, three months later, two have arrived. Exciting! Will the other two make it? Drama! I was annoyed when I thought the postcards had been lost, but now I’m glad that they ultimately took so long to arrive. It’s like the Costa Rican postal service created a special account for me to deposit good wishes into the future. 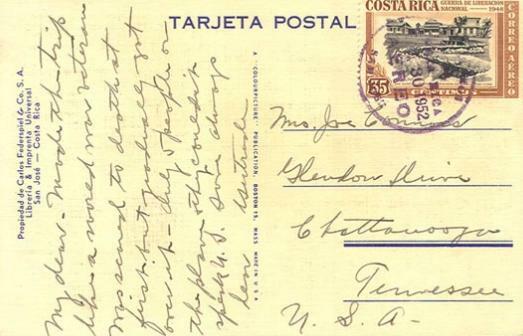 Travel postcards are perhaps the only form of communication that get better with age. A text message that took three months to arrive would not leave me with the same warm and fuzzy feeling.